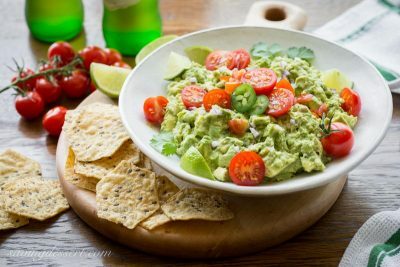 Easy Spicy Guacamole ~ don’t spend a small fortune on restaurant guacamole, when it’s much less expensive to make at home! 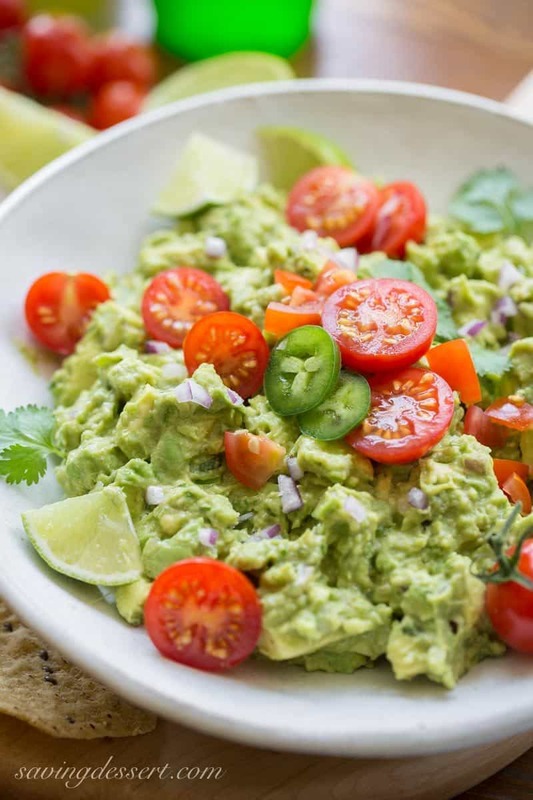 Guacamole is incredibly delicious made fresh at your own table, hand crafted and seasoned just the way you like it … and it’s super easy to make too. You may have heard about the health benefits of eating the mighty avocado. With heart healthy fats, fiber, and antioxidants, avocados can even help lower your cholesterol. With more potassium than a banana, it makes sense to add this nutritious fruit to your diet. So I say … eat more guacamole! 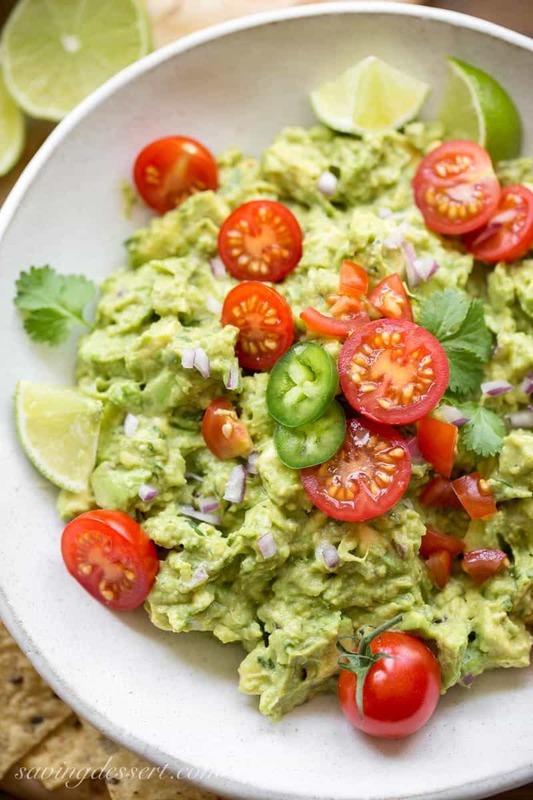 With just a few fresh ingredients this Easy Spicy Guacamole Recipe comes together in minutes. 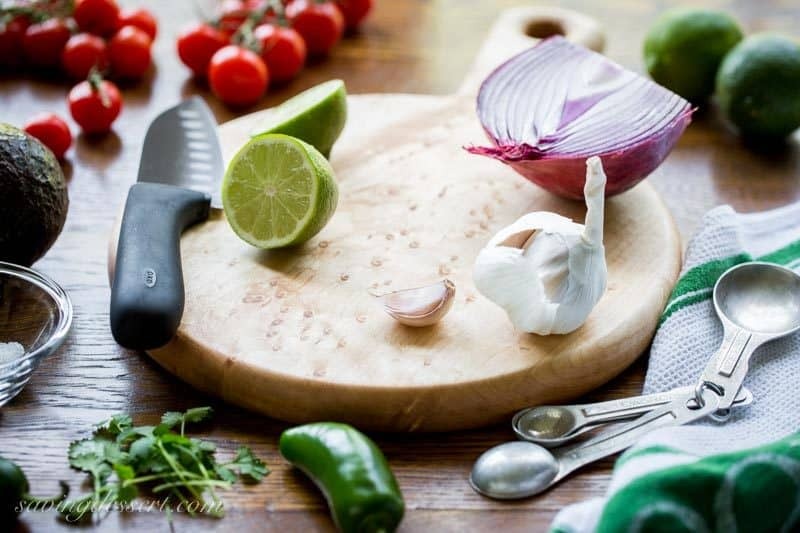 Juicy limes, crisp red onion, fresh garlic, cilantro, jalapeño and ripe avocados are combined with our favorite seasonings, for an interesting and flavorful dip. Some guacamole recipes include chopped tomatoes, but I prefer to add them only as a garnish. Juicy chunks of tomato can water down a guacamole dip, so take care if using or add at the very last minute. Are you loving my gorgeous new Bird’s Eye Maple cutting board? It comes from my friend at Michael’s Woodcraft. Michael is extremely talented and he’s such a nice guy too – I hope you’ll pop over to his website and check out his work. All his creations make great gifts and can be personalized and engraved. I could go on, and on, about all his beautiful handcrafted heirlooms, but you’ll want to see for yourself. Be sure to follow him on Instagram! He posts fascinating photos of his work in progress too. Thanks Michael! Our Easy Spicy Guacamole is great slathered on a tostada with Homemade Refried Beans, or alongside a tasty Grilled Chicken Taco Salad. We love a big spoonful rolled up in a burrito, or dolloped on tender Chicken Fajitas. 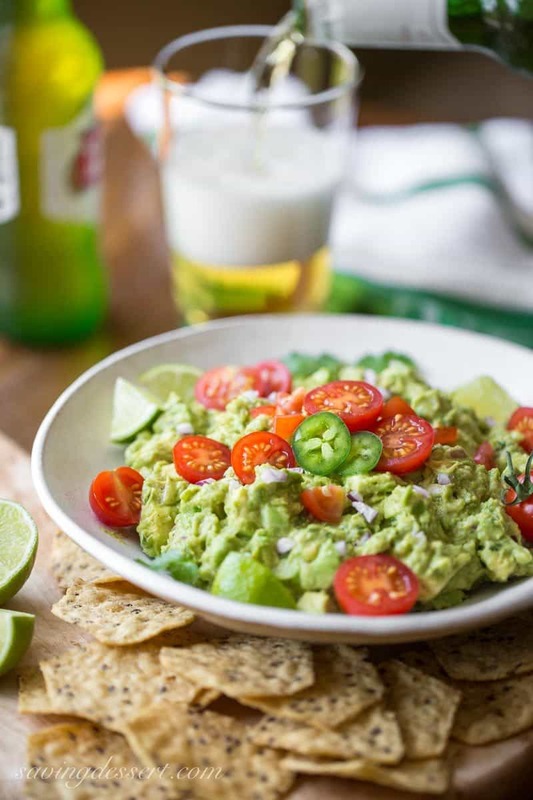 And I’m not too embarrassed to say, we can make a decent Friday night meal out of guacamole, chips and a beer! Guacamole is best served as soon as it’s made but will remain fresh for a day or two, as long as you’ve added plenty of lime juice. When storing overnight, scoop leftover guacamole into a container that has a tight fitting lid. Squeeze a little extra lime juice on top of the guacamole, then press a piece of plastic wrap onto the dip before sealing with the lid. A tall tupperware type container works great for this purpose. The color will stay much brighter with no air hitting the mashed avocados. Once you make your own Easy Spicy Guacamole Recipe, you may never want to order bland, take-out guacamole again! incredibly delicious made fresh at your own table, hand crafted and seasoned just the way you like it ... and it's super easy to make too! In a large mixing bowl, combine the cilantro, jalapeño, onion, 2 tablespoons of lime juice, garlic, salt, pepper, cumin, and cayenne. Cut one avocado in half, remove the pit, scoop out the flesh with a large spoon and add to the bowl with the spices. Using a fork, mash the avocado until mostly smooth and combined with the onion mixture. Halve the remaining two avocados, remove the pits then carefully make 1/2-inch crosshatch cuts in the flesh with a table knife. Cut all the way through the flesh but not through the skin. Using a large spoon, carefully scoop out the avocado cubes and add to the mashed mixture. Sprinkle the remaining 1 tablespoon lime juice on top of the cubes. Using a rubber spatula, fold the cubes into the mashed mixture taking care to leave the guacamole somewhat chunky. Check the seasoning and adjust if needed. Transfer to a serving dish and garnish with extra chopped red onion, cilantro leaves and chopped tomatoes if desired. Guacamole is best served immediately but will keep for a day or two if properly stored. Scoop leftover guacamole into a container that has a tight fitting lid. Squeeze a little extra lime juice on top of the guacamole, then press a piece of plastic wrap onto the dip before sealing with the lid. Finally, we’re very excited to be sharing some of our favorite Mexican inspired dishes over the next couple of weeks so please check back soon! Cinco de Mayo (May 5th) has become a bit of a foodie holiday centered around all things Mexican-American. The original celebration was to remember the unlikely victory of the Mexican Army over French forces in 1862. If you’re planing a little get together, perhaps you’d like to try our Sweet Corn Salsa, or this delicious Pineapple Salsa from the SRFD archives. And don’t forget a slice or two of Margarita Pie with a Pretzel Crust or our Creamy Margarita Bars for dessert! Amazing Hummus Easy Honey BBQ Sauce Recipe Spicy Southwestern Spinach Dip Easy Jalapeño Popper Dip The Game Day Edition – Appetizers and Dessert! Just tried this recipe and it was AMAZING! Just the right amount of spicy and I love that it was chunky instead of creamy. I couldn’t stop eating it. AWESOME! Thanks so much for giving this recipe a try Lori. We LOVE this guacamole and could eat the whole bowl in a flash 🙂 Great on everything! Love Mexican and love my guacamole, looks so delicious Tricia!!! The Birdseye Maple board looks great in your pictures!!! I love your beautiful board, now my beautiful board Michael! You are a talented artist. Have a wonderful week and thanks again. Me too Greg – hope you’re doing well! Have a great weekend. Who doesn’t like guacamole? Or should we make that LOVE guacamole? 🙂 This looks wonderful. Terrific pictures, too — love the highlights on the tomatoes! Agreed – guacamole is one of my all-time favorite spreads or dips. Thank you so much John! We probably devour 3 to 4 avocados a week, love them to pieces. Your spicy guacamole looks delicious, I think this would make the perfect dinner. Pass the bowl, please! It looks delicious, Tricia! I haven’t made guacamole homemade in a long time and want to after seeing this. It’s perfect for Cinco de Mayo or any day. Thanks Pam – I hope you get the chance to try it! The mixture of mashed and cubed avocados and the double dose of heat make this one to die for guac!! I could eat it with a spoon!!! It’s a delicious recipe Liz – thank you so much! It’s such a happy thing when I get my hands on good avocados! But everything you make always just looks that much more delicious, Tricia. I would plow through this guac in record time. It looks fresh and delicious. That is so sweet Monica! Thank you – and we did put it away in no time flat! Yes! It’s MUCH better homemade when all the ingredients are fresh and flavor is at its peak. This looks gorgeous! Thank you Maureen! Hope you’re doing well. Thank you Susan – the avocado growers should be very happy with all the guac love! I love your spicy version of guacamole. I could eat it all. It is hard not too for sure Gerlinde. Thank you! Hope you’re having a magnificent trip! Me too..a meal! Gosh you’re busy ..so many new recipes..:)! We’re on the same spicy appetizer page today, wish we could have a drink together with both of them! Margaritas, chips, salsa and guacamole – sounds great to me! I’m with you Chris – this is one of my favorite dishes ever. Thank you! Looks and sounds excellent Tricia. When I eat Mexican, the one thing that always gets gets finished off is the guac. I do love my guacamole too Larry – thank you! You are not going to believe that if I told you I had a whole bowl of guacamole as the breakfast 🙂 This stuff is addictive!! Yours looks really FRESH and delicious, Tricia. I do believe you Angie and I understand! Guacamole is great any time of the day or night too 🙂 Thanks!